IF INDEED THERE ARE BIG MEN WHO WANT THE MARKET, WHY NOT INVESTIGATE FIRST? It is not the first time that businesses have been burnt to clear for development. If it is true that there are big 'men' who want the Park Yard market area, why then should any construction go on now before the facts are established? Who owns this land? The owner of the land should come out straight on what next instead of petty traders making those easily destroyed constructions which will be gutted another time if the right strategy is not got. 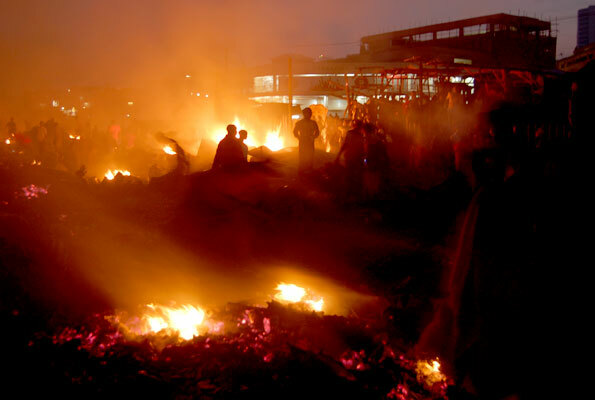 Hundreds of traders whose efforts to save their merchandise were futile, have lost their merchandise worth billions of shillings in the inferno. By 10am Sunday, police firefighting canons could still be seen on site. Police has also heavily deployed at the premises to keep law and order, and stop thugs looting the little merchandise which was saved. Owino, also known as Parkyard Market and St. Balikudembe Market, is Kampala’s largest outdoor market with over 500,000 traders. The Parkyard Market, established by traders as a secondary market in the car park of neighboring Nakivubo Market, has been a center of trade on second-hand items like textiles, shoes, bags, electronics, and tarpaulins. Most of the vendors at the fire-gutted market have been left with nothing, since most of them and their families depended on the market trade. Others had secured soft loans from financial institutions following the 2009 fire to enable them re-establish their businesses but are now back to zero. Most say they are left stranded since they had not fulfilled entirely their loans and speculate that it would be difficult to acquire more loans. This is the second time the market has suffered such a fire on a large-scale. 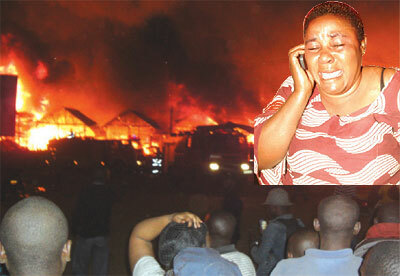 The last time the Owino traders lost their property in a fire was in late February 2009. In the 1980s, the parking was taken over by the market vendors. It is news, but not a surprise that on the eve of the 18th Anniversary of the Coronation of His Highness King Ronald Muwenda Mutebi, Owino gets gutted by fire. It is most likely that the burning was organized by some party. The question is why burn the market? Possible answers include that the market has people wrangling may be some of them could resort to burning the market as a strategy. The second possibility is that in the business we see today, many people are using borrowed funds from banks and some of them may be defaulters. These can easily sabotage the business of others so that the fire is used as a cover up for their failure to pay. There is also the possibility that some circles are not happy with the fame and popularity enjoyed by the Kabaka of Buganda and could use the fire to punish the people in the market many of whom cherish the Kabaka. It is only prayers that the people who have lost property recover. There is nothing to do because this is not the first fire. Firefighters battling with the flames up to morning. 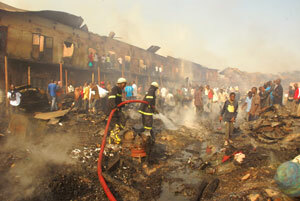 OWINO park-yard market for the second time in a period of about two years was last night razed down a monstrous fire. The blaze, whose cause has not yet established, broke out at about 1am on Sunday morning. The park yard is adjacent to St. Balikuddembe (Owino) market, the city’s biggest market. Hundreds of traders whose efforts to save there merchandise were futile, have lost their merchandise worth billions of shillings in the fire. By 10am, police firefighting canons could still be seen on site. Police has also heavily deployed at the premises, to keep law and order, and stop thugs looting the little merchandise which was saved. The market mainly sells second-hand items, like textiles, shoes, bags, electronics, and tarpaulins. The yard was originally used as a parking area for Nakivubo Stadium. Property worth billions of shillings is estimated to have been lost when the Kampala downtown Nakivubo park-yard market, part of the popular Owino market, also known as St Balikudembe Market, went up in flames on Sunday night. This is the second time that the market with an estimated 25,000 traders, largely women, is being ravaged by fire in two years. The cause of the fire is not yet known. But the Division Police Commander Old Kampala Siraj Bakareke who rushed to the scene moments after the fire started, said the fire started from a stall near the gate to the market on Swaminarayan Road adjacent to the New Park and quickly spread to the rest of the market. “We are investigating the cause of the fire. It started between midnight and 1.00pm but climaxed between 1:30am-2:00am,” he said in an interview. No injuries were reported save for traders who fainted upon seeing the ashes that had been their merchandise. It is understood that most of the traders are repaying loans they had got from banks to recapitalize their businesses following an earlier fire that gutted the market in February 2009. Without making any specific reference, the traders in groups of three to five, kept on lamenting and cursing whoever could have been behind the fire. “This is an indirect way of telling us to go back to village. I think even those who went back to the village after the first fire are now better off than us. Now even the transport to take someone to the village has been destroyed here (in the fire),” said Rajab Nsubuga, who had three stalls of secondhand shoes razed. “It is true that God cares about us all the time, but this time I think He did not. I do not know what type of death to recommend for whoever did this. I cannot imagine what that person is feeling at home right now,” lamented Faridah Nassolo, a food vendor who could not locate in the chaos her workstation. All the merchandise in the market was destroyed save for probably less than hundreds of traders’ property which was at the entrances to the market. All the stalls and stores were reduced to ashes making this probably the biggest fire the country has ever suffered. 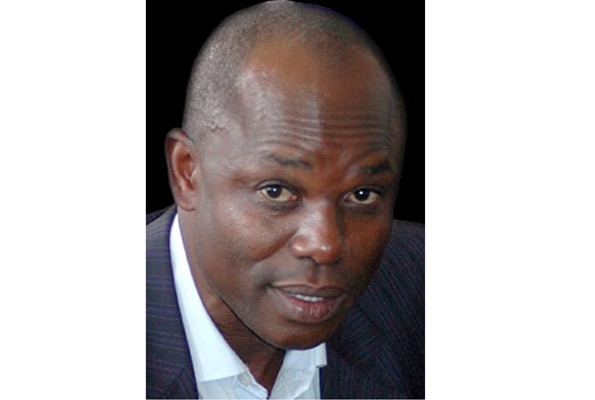 UNATU is not being serious about teachers' plight on calling off the strike at this material time. One needs to be a visitor in Uganda to do just that. It is sad that in 2001 we formed Makerere University Private Students' Parents' Association (MUPRISPA) with one of the objectives to see Government put in place an Education loan scheme. President Museveni in his election Manifesto of 2001 promised that his Government would implement an educational loan scheme! What became a fact is that some few students got payment for their education by State House and today, 2a decade after, the educational loan scheme has never been implemented. You may wonder how many in Government have their children affected by the current primary teachers’ strike, and it is for that reason among others that teachers should remain on strike until Government gets to think about them as worthy having a pay that can see them as entities in this corruption ridden country. It is sad that Government machinery keeps on talking about ghosts here and there, instead of having concrete administrative machinery, they are just being fooled by politicians who have taken money and keep reaping the same money simply for gossip and singing NRM praises. President Museveni is well aware that many who are in administration in his Government went to Government schools which his Government has not seen as a priority to promote and they are rotting away, as private developers mint millions in education. The respect we had for teachers is long gone. It is his time that has seen the teaching profession deteriorate to the extent that teachers opt to ride motor cycles for a living. This is unacceptable. The NRM Government must wake up and take the providers of services like education, health to mention a few as entities. Our parents never failed to pay fees while they taught, and today, looks like many in Government given the luxury they enjoy, they don’t know that the salaries of these people cannot buy a worthy living; if they know, then it is unfortunate that they are not bothered. For UNATU, the sensible thing to do given that teachers don’t have morale is to keep their tools down. It is no big deal if children can start holidays now, meanwhile Government organizes itself given that it had for long taken them that cheap and now it is only a strike that will get results. How can a teacher teach for shs 200,000 when University education is in millions? Are they supposed to steal to get the money or what or that their children are not entitled? The Electoral Commission now wants over 150bn for just useless LC1 elections. Go down and see whether a part from land deals whether these councils are doing anything worthy that money which one values more than the teachers. Why can’t we have people electing in a simple way for these local persons? What is the big deal? Why can’t Government come up with a strategy to see the civil servants who languish in poverty due to its ill advised policies that can see them enjoy as reasonable members of society? If things are that bad, let them get a quota each for the basics of life at prices half what is ruling. Let their children be sure of education in University and other Institutions of Higher learning on different terms or even have Students loans. There MUST be a way the Government of President Museveni has to get to terms will the ills the people of Uganda go through. Those in Audit MUST establish the source of those who are doing business from tax payer resources which money should have been put to areas like paying the civil servants better. We simply cannot continue with the inequalities NRM has created and hope for peace. The national Executive of the Uganda National Teachers Union (UNATU) have agreed to temporarily call off the sit down strike to allow room for negotiations with the government over their salary demands. Teachers across the country are demanding that government doubles their salaries. The strike entered a third Friday. UNATU vice chairman James Tweheyo told Kfm, that they agreed to temporarily call off the strike after they received a communication from government that the Ministry of Finance was ready to review their salary structure with a possible increment. “We are suspending this strike up to August 28,” Mr Tweheyo said. “We hope that by that time we shall have had enough negotiations with the government and we will be able to report back to our members the results of the negotiations. Union official held a meeting with President Yoweri Museveni on Thursday at which he asked the teachers to be mindful of national priorities. The meeting came amidst strikes by teachers in government aided primary and secondary school. A primary school teacher currently earns a gross salary of Shs270, 000 while secondary school earns a gross salary of Shs450, 000. Government last year gave teachers a 30 per cent salary increase but this was subjected to a 30 per cent Pay As You Earn tax. After 40 years of fundraising, construction of the 15-storey Church House building in Kampala has started. The construction work by Ms Cementers (U) Ltd is slated to last 18 months and will cost believers $16.3 million (Shs40.75 billion). "The Church invested the money obtained from previous fundraising efforts into viable ventures and is now using returns from these investments to begin the construction process," the Archbishop of the Church of Uganda, Henry Luke Orombi, said yesterday during a tour of the site on Kampala Road by a team of bishops. However, he noted that the Church of Uganda through the Board of Trustees is in the process of negotiating a loan facility with selected financial institutions to secure funding. "Whereas the construction work has begun, we have not attained all the funding to complete this project." The archbishop also disclosed that at the moment, the church trustees were selling some of the mission's properties that have not been making good returns and the proceeds would go into financing the project. Flanked by all bishops of the Province of the Church of Uganda, the Archbishop commended all involved and appealed to believers to support the work through their respective dioceses, which are entitled to buy shares in the project. "The dioceses will enjoy a return on their investment once the project is complete," said archbishop Orombi. 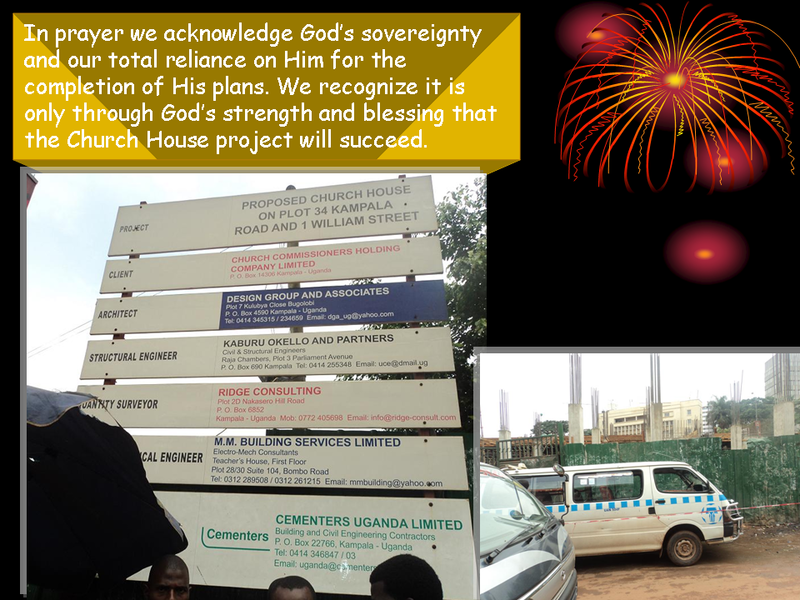 The Church of Uganda has found an American investor willing to partner in the long-delayed Church House project. The Church of Uganda Provincial Secretary, Reverend Aaron Mwesigye, declined to name the American investor, but says that with his support, the construction of the 10-storey Church House begin in July this year. He says work on the building, which was commissioned in February 2003, was delayed because the Province had only raised 720 million shillings, which was insufficient for substantial construction work. The estimated total cost of the Church House Project is 25 billion shillings. The American investor arrives in Uganda next week to discuss the terms of reference regarding his partnership. Late Archbishop of Uganda, Janani Luwum, initiated the Church House project to serve as an income generating venture and a means to guarantee the welfare of clergy and lay workers in the Anglican Church. Church of Uganda clergy and staff are poorly paid and retire without any pensions or benefits. Archbishop Luwum laid the foundation stone of the Church House in 1977 during celebrations to mark 100 years of Christianity in Uganda. The project has been fraught with accusations of mismanagement and misappropriation of funds. For the past 30 years the Church of Uganda has been fundraising for the Church House, but with little to show for it. Reverend Mwesigye, who also serves as the Chief Accounting Officer of the Province of the Church of Uganda, admits that financial impropriety may have led to the delays. 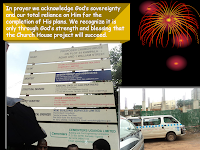 He is however optimistic that the problem has been overcome by the current church administration and expects the project to be complete within one year. Theme: “Better living through planned land use”. 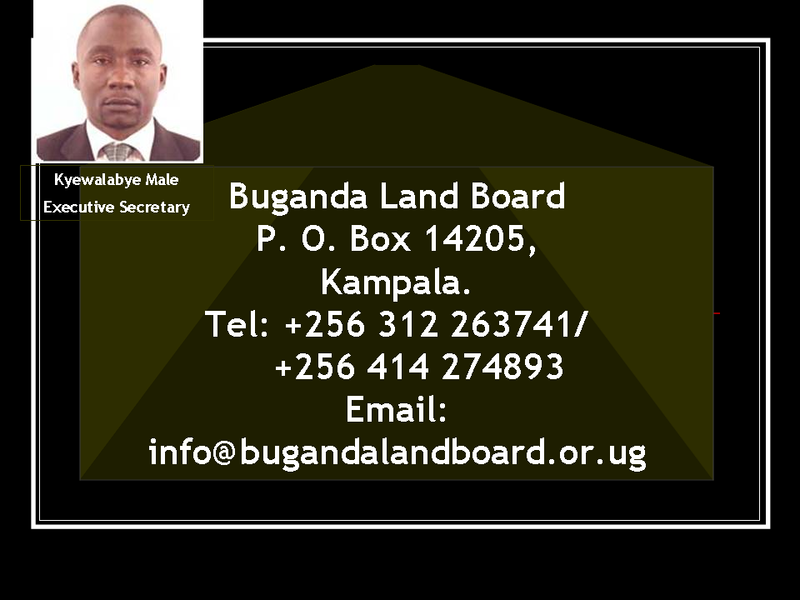 The 2nd Grand Land and Property fair 2011 is being organized by Buganda Land Board in collaboration with the Ministry of Lands, Housing and Urban Development and National Housing Company. The Fair is in its second year running. It is meant to promote the real estate business through land and real estate business practitioners, financiers, clients as well as Government as the policy body. The major objective of the Fair is to provide space for making business relationships and to open the doors to new businesses especially in the concerned sectors. 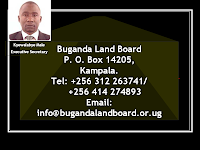 The maiden fair was successfully hosted by Buganda Land Board in October 2010 at Bulange – Mengo under the theme “Land is a finite resource” and attracted 100 exhibiting companies and over 10,000 visitors. The Fair in 2011 will present yet another opportunity for business people to interact with prospective clients as they show case innovations in the industry while getting instant feedback from clients. Bulange Plaza is one of the assets Buganda Land Board would like to finance to completion, this however will greatly depend on whether the Central Government pays what is due to Buganda Government in form of rent for properties they are utilizing. The Tourism center is doing good work in promoting Buganda internally and outside. This is one of the properties for which Buganda Land Board expects money to help developments at Mengo if Government pays what is due to Mengo in form of rents. It is unfortunate the mess in which Uganda is. Some of us are fortunate to have been brought up when Governments then were paying reasonable money to workers. You cannot believe that a person works for Government for a whole month only to get shs 250,000. What can this money pay? Yet, you find people who have made billions during NRMs time like Bassajjabalaba. The unexplained source of money which some of these people own could partly be the reason why the economy is in terrible shape. The Auditor General has stopped payment of more than Shs142 billion in compensation to city businessman, Hassan Basajjabalaba, for lack of reasonability, legal basis and supporting documents to the claims. 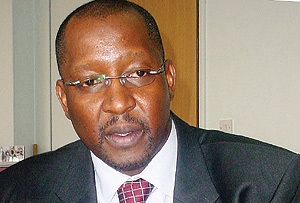 Instead of Shs142.6 billion the city businessman says is due to him from government, the Auditor General in a new verification report issued on Tuesday, July 26, recommends that Mr Basajjabalaba’s Haba Group of Companies actually owes the government a net amount of Shs994m. The debt arises from money transferred to Haba in payment of what has turned out to be false claims and breach of contract. “The assessment has determined that instead of an amount of Shs142.6 billion claimable by Haba Group, Haba owes government a net amount of Shs994 million,” a report arising from a forensic audit done by KPMG Kenya, an international auditing firm and signed by the Auditor General, Mr John Muwanga, reads in part. But even as the Auditor General moves to block the payment to Mr Basajjabalaba, it emerged that before the verification exercise was concluded Bank of Uganda, upon a request from Ministry of Finance, issued guarantees to various commercial banks to enable him access credit facilities totalling to $65.35 million (about Shs160 billion) in anticipation of government settlement of the claims by Haba Group. This is in addition to Shs24.5 billion paid to Bank of Uganda and Uganda Development Bank by the Ministry in 2010/11 financial year to settle the indebtedness of Haba Group to the two banks. According to Bank of Uganda, by June 2011, two of the credit facilities offered to Haba Group by two of the said commercial banks had fallen due before government had paid the amounts claimed by Haba. Bank of Uganda, as the guarantor, had as a result paid $34.35 million to the two banks. Mr Basajjabalaba’s Haba Group of Companies, through four of its subsidiary companies; Sheila Investments, Yudaya International, Victoria International and First Merchant International Trading company, entered into lease agreements and management contracts with the government for four properties namely; Nakasero market, Shauriyako market, Constitutional Square and St Balikuddembe market (formerly Owino market) during the 2009/10 financial year. However, all the agreements were later terminated by the government after the market vendors and Parliament opposed the move. For claimed loss of business in the St Balikuddembe market contract given to him at Shs1 billion, Mr Basajjabalaba is asking for Shs23.5b while for Nakasero’s annual management contract valued at Shs299.9m, he is now asking for Shs47.8b. Information on the file indicates that in 2006, KCC officials leased Nakasero market to Mr Basajjabalaba for 49 years. For Shauriyako market, Mr Basajjabalaba is demanding Shs19.7 billion and an extra Shs55.4 billion for the Constitutional Square redevelopment venture which fell through. In a letter dated March 31, 2009, signed by Mr Basajjabalaba as Chairman of Haba Group and addressed to Ministry of Justice, he demanded compensation for losses incurred as a result of the decision of government together with the defunct Kampala City Council to cancel the lease offers and management contracts granted to his companies. But KPMG said in its report it could not trace a common management for the four companies at the Registrar of Companies. During the auditing, KPMG obtained various board resolutions dated from March 10, 2010 to March 15, 2010 authorising Haba Group to receive proceeds of the claims against KCC and the government in respect of markets. However, the Auditor General said in his report that, Mr Basajjabalaba confirmed to auditors that the shareholders are all associated to him through kinship. Mr Basajjabalaba’s Haba has to-date maintained that they have a valid claim as they incurred losses from expenses incurred in execution of their contracts as well as the lost business opportunities that they would have gained had the contracts over the markets been implemented. The Taxi business has been left to UTODA who seem to lack the scientific management of the business. If Government got a good deal from the tenderer, many taxi parks would not be in such a sorry state. The Government rents premises of Buganda Government including the Mengo Court Building, but it surprises that Government does not see it as a necessity to pay what is due to Mengo in time, which constrains the other projects may could undertake on behalf of the people of Buganda. The monies due to Buganda Government from the central Government could go a long way in seeing Bulange Plaza and other infrastructures modified, but trust NRM Government, they think that is 'justice'! Another view of Bulange Plaza which if completed can greatly help the income of the Buganda Government, that is for once, if the Central Government pays what is due to Mengo administration. You can trust NRM Government; the armed vehicles are on alert to deal with any demonstrations! The President has all along wanted to turn around the country, but this is not a job one man can do. He forgot that with time, when you overstay in office, diminishing returns apply, and now the outcome of this is a big army of near to useless people who are paid handsomely. Many did not expect Museveni as a candidate to make more than 50% in the recently concluded elections. These ‘facts’ are a result of many deals which involve not only tampering with voter registers hence leading to a number of people bouncing where they normally vote from, but also outright dishing of cash at various levels. MPs got shs 14m and shs 6m was taxed. It is only an idiot you can tell that Government gives you money for its programmes and such money is taxed. Secondly, given that many of the MPs have big bank loans, it is illogical to deposit money you expect for a Government programme on an individuals account. The Late Sulaimani Kiggundu's Greenland Investment Company bought Uganda Grain Milling from Caleb International who had won the bid to buy the company, and it is alleged that good will not less than shs 500m could have been paid to Caleb International! There are companies that have benefited from hand outs in big amounts through such criteria not clear and this has all been a loss to the tax payer. NRM Government is spending a lot of money into its patronage scheme which among other strategies helps to see it remain in power. This time round in the recently completed elections they over did it, and the results are there for all to see. Now, the public are striking simply because they think that is the only way to see the NRM get priorities right. It surprises to see people whose source of money iis not clear buy land and put up buildings in record time. Much of this money is believed to be spills from Government resources. Where the country has professionals, you get the transport sector run by non professionals. The mess is so great, those operating in the business are taxed and money is not receipted (talk of welfare without accountability), but because NRM benefits from their ‘services’, they are left to mess the thing the more to the extent that one can sit in a taxi from the Main park at Kampala for an hour before it reaches the clock tower. A gentleman started constructing two houses using concrete bricks within the same plot of land. This man is making tile roofed houses which are progressing very fast, and surprisingly, he was able to buy an adjacent piece of land at shs 100m and he paid cash. Much of this money is believed to be from patronage resources. There are many near no bodies who own buildings around the country and one wonders where they get the money from. Some of these are believed to be disguising the actual owners. WASHINGTON, July 25, 2011 – On the eve of the international emergency summit on the unfolding tragedy in the Horn of Africa, the World Bank today announced it is providing more than $500 million to assist drought victims, in addition to $12 million in immediate assistance to help those worst hit by the crisis. More than 11 million people in the region have been hit by one of the worst droughts in 60 years, resulting in widespread hunger, deaths, and the loss of subsistence crops and livestock. Rising food prices and deteriorating livestock prices have exacerbated the situation, and the UN is warning of worsening conditions in the coming months. The International Development Association (IDA) which serves as the World Bank's Fund for the Poorest, and the donor-funded Global Facility for Disaster Reduction and Recovery (GFDRR) are making these funds available with more than $500 million coming from restructuring of existing projects and immediate reallocation and fast track processing of new projects, including with funding from IDA's new Crisis Response Window, subject to approval by the Board of Executive Directors. This funding could support the following activities: (a) a regional Enhanced Drought Resilience and Livestock Recovery Program to restore livelihood in all countries in the region; (b) scale up - through additional financing - of the Ethiopia Pastoralist Community Development Project; and the Productive Safety Net Program; (c) a possible new agriculture operation in Ethiopia; and (d) a possible operation in Djibouti. Another $12 million will be immediately available in GFDRR financing to rehabilitate rural livelihoods; build drought resilience; assist farmers to resume planting in time for the next harvest through cash transfers, seeds, fertilizer, and farming tools. In Somalia, the support program will be implemented building on previous rapid response operations and partnership with the Food and Agricultural Organization (FAO) and on their presence and ability to deliver in Somalia’s most affected areas, where circumstances permit. The GFDRR funds are also immediately available to support regional drought resilience planning based on a regional needs assessment and developing regional capacity in Disaster Risk Reduction and Resilience. Following decades of recurring droughts in the Horn of Africa, several World Bank-financed projects have established contingency and risk financing mechanisms that will be used to immediately scale up response to drought affected communities. “The recurring nature of drought and growing risk it poses to social and economic gains in this region calls not only for immediate relief from the current situation, but also for building long term drought resilience,” said Obiageli Ezekwesili, World Bank Vice President for the Africa Region. This World Bank support builds on strong collaboration with national governments, international agencies, regional and non-governmental organizations. This support includes drought impact assessment in collaboration with the Intergovernmental Authority for Development (IGAD) and early livelihood recovery in partnership with the FAO. The World Bank is also supporting countries to develop early warning systems and strengthen drought management agencies that help plan crisis response. In the longer term, it is important for countries in the Horn of Africa to prepare for recurring droughts that climate change will make more intense. An integrated approach to food security, poverty, and climate change is needed. The World Bank announced in April 2011 that rising food prices have pushed 44 million people into poverty since June 2010. Another 10 percent rise in the food price index could push 10 million more people into poverty. Global action is critical and international partners could help by supporting small holder farmers with seeds, fertilizer, better weather forecasting, and monitoring crop production; creating better ways to get produce to markets; providing food and effective social safety nets for the most vulnerable. The World Bank Group is boosting agriculture and agriculture-related investment to $6 - $8 billion a year from $4.1 billion in 2008. The past two years of implementation of the Africa Region’s agricultural strategy achieved more than a doubling of finance to the sector, from about $0.5 billion per year in 2008 to $1.2 billion annually averaged over 2009-2010. The World Bank’s Agriculture Action Plan emphasizes increased support in five areas: raising agricultural productivity; linking farmers to markets; reducing risk and vulnerability; improving nonfarm rural employment; and making agriculture more environmentally sustainable, as well as a source of positive environmental services. 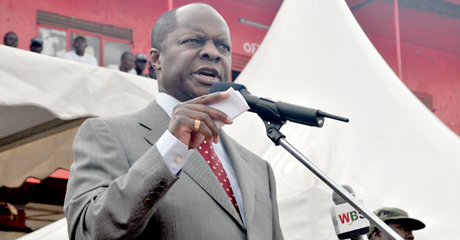 Today, 28th July 2011, His Highness King Ronald Muwenda Mutebi officially launches the use of Bio gas in Buganda. This is against the background that many people don't know how the technology works yet many have resources that can see it in use at household level. The photo is of a domestic bio gas plant which uses ripe banana peels which when crushed ensure the user of bio gas. This can be emulated by many, more so at a time when our forests are being cleared for firewood and charcoal. Water harvesting can greatly help supporting the mixing of inputs into the bio gas production, as that water is preferred to tap water as supplied by National Water and Sewerage Corp. The wastes from production of bio gas are useful in the garden for healthier crops. Kabaka Ronald Muwenda Mutebi on Thursday warned the Baganda against kingdom traitors describing them as agents of doom whose target is to bring down his kingdom. Addressing thousands of kingdom royalists at Nakasero market, Kabaka Mutebi said some people were pretending to be serving Buganda yet they are conspirators. “We are aware of some people who are pretending to be on the kingdom’s side yet they are agents. They aim to weaken the kingdom and destroy its main pillars,” Kabaka said amidst the cheering crowd adding, “They are trying to fail us in this battle but we should remain united,”. On Tuesday, seven people claiming to be members of the royal family stormed the Mengo palace [Lubiri] saying they wanted to meet the Kabaka. Although the Kabaka doesn’t reside there, the group claimed that they have on several occasions been denied audience with the Kabaka whom they call their brother. The group also accuses kingdom officials of misleading the Kabaka and illegally parceling out kingdom land. They were later engaged in a scuffle with kingdom supporters who accused them of trying to bring confusion in the kingdom. In the melee that ensued, the disgruntled royals were injured but this didn’t stop police from arresting them. Mutebi arrived at Nakasero Market in Kampala amidst celebrations from ecstatic traders at around 10; 45am accompanied by Katikkiro John Baptist Walusimbi and several Kingdom officials. The huge cheering crowd lining the streets prompted the Kabaka to disembark from his 12 car motorcade and walk through Sinayi-bin and Dastur Street to the market. He was welcomed by market leaders, Lord Mayor Erias Lukwago and other divisional mayors. Nakasero market and several shops in the upper Kampala remained closed while several streets including Market Street, Entebbe Road, Luwum Street and Dastur Street were closed to traffic. Kabaka’s tour through the Central Business District is part of the activities to celebrate his 18th coronation anniversary scheduled for this Sunday at Kasangati –Gayaza, Wakiso district. Kabaka also decried the poor working environment and business fractuations which traders were going through but encouraged them to join hands against oppressive policies and challenges. From Nakasero, Kabaka continued to Kawempe Division where he is to commission a Bio gas plant in Gayaza and visit model farmers in Namugongo. The Kabaka’s programme was clashing with that of President Museveni who was also scheduled to visit down town Kisekka Market yesterday but postponed his visit “until further notice”. The kingdom has a strained relationship with central government over unfulfilled pledges and demands. Since the Kabaka was enthroned in 1993, the kingdom has been pushing for the return of its property including land; officials’ estates that were seized by the post independence government of Dr Milton Obote (R.I.P) who abolished the monarchy in 1966. Kabaka Mutebi was enthroned as the 36th Kabaka of Buganda on July 31, 1993. The kingdom rotates the coronation celebrations in the 18 traditional counties to enable the host county benefit through rebuilding its headquarters. During his 17th coronation anniversary celebrations last July, the Kabaka sent a strong demand for the kingdom to be granted a federal status. Bweya Moslem Primary school is found about one and half miles Entebbe Highway at Kajansi Trading Centre. The photo gives you the picture in which the school is and a real danger to the pupils as anytime it can claim lives. The officials at wakiso ought to do something early enough. The Global Call to Action Against Poverty (GCAP) has been seeking contributions from the civil society in the form of inputs to prepare an annual World We Want Report which would be launched on the International day for the Eradication of Poverty. GCAP is trying to provide a lobbying tool for civil society to present to political decision makers a roadmap for achieving the Millennium Development Goals (MDGs) and eradicating the structural causes of poverty and inequality – based on existing successes and knowledge of what works in transforming existing systems of exclusion. The GCAP began as a movement to bring civil society together, across specific areas of thematic, geographic, or constituency focus, to unite diverse actions against poverty and inequality. One of its greatest challenges has been finding tools that will promote unity and solidarity within such a diverse movement. While specific events, such as Stand Up and Take Action, and moments, such as the detention of activists, have promoted solidarity and common action across the movement, there has been less success in creating common lobbying tools that can be shared. While common lobbying positions have been developed, and citizens charters around certain global meetings or summits, the Global Call to Action Against Poverty (GCAP) sees the World We Want Report as an opportunity for members of the civil society to challenge prevalent development discourse about areas of growth and success in the fight against poverty, present a unified and alternative understanding about inclusion, and a people and planet centered approach. By developing an annual World We Want Report and launching it on the International Day for the Eradication of Poverty, GCAP sees itself as providing a lobbying tool for civil society to present to political decision makers a roadmap for achieving the MDGs and eradicating the structural causes of poverty and inequality – based on existing successes and knowledge of what works in transforming existing systems of exclusion. i. To mark the International Day of the Eradication of Poverty as a point of common action for civil society, to reach governments across the world with an assessment of the progress that has been made in addressing the agenda of poverty and inequality at the national and global level across the year. ii. To identify the most effective ways for government and civil society to take action against poverty, and consolidate the collective experience of the movement’s demands. iii. To articulate common goals for the struggle against poverty and inequality in the year ahead and develop collaborative action plans where appropriate. I have had time to read some of the stories published commemorating one year after the July 11th 2010 killings of innocent people and those that were injured to various levels. When I imagine what the people who lost their loved ones went through and still experience to-date, as well as those who were injured some of whom will never recover to the level they were in, i have one thing for our leaders. They are insensitive! Some of them can as for now not experience such simply because they are in heaven on earth in Uganda. We call for problems we cannot solve and imagine that we are helping fellow Africans! This is sad. The testimonies are evidence that people have suffered a lot. We have enough problems. Our people are paupers and what we are doing on a daily basis is to manufacture more dependents. I only wish our Parliament could stand and reason beyond a few interests. You cannot reason that those African countries that have not taken troops to Somalia are insensitive. The matter is beyond what they can afford given the multiplicity of problems they have, but the leadership in Uganda is indifferent! Tears flowed down the cheeks of relatives and friends of those who lost their lives in the July 11th terror attack at the Kyadondo rugby club as they marked the anniversary of the bombing. Minister Hilary Onek who was representing government could not hold back his tears when he spoke to a 7 year girl who lost her father in the blast. Many other people broke down and cried as they recounted the events of the night of 11th July. The memorial prayers, organized by the Inter Religious Council of Uganda, and the management of the Kyadondo rugby club were led by Namirembe Bishop, Wilberforce Kityo Luwalira and Pastor Joseph Seruwada, the overseer of the Pentecostal Churches in Uganda. Minister Hilary Onek delivered President Yoweri Museveni’s message to the gathering saying the nation shall not forget that tragic day and the country shall continue to mourn the people who lost lives at the hands of the merciless terrorists. President Yoweri Museveni has paid tribute to July 11, 2010 bomb victims urging the international community to take decisive action to end the Somalia tragedy. In statement released Sunday night, the President said Somalia is now a threat to the economies of Eastern Africa and the world. He made the call in his remembrance statement on the eve of the July 11 al-Shabab twin bombings in Kampala that left 76 people dead and hundreds of others injured. “As we remember our citizens who lost their lives at the hands of terrorist bombs planted in Kampala, on 11th July, 2011, I send my deepest condolences to their families. I want their families to know that we will never forget this tragic day. We will always mourn for the youth and vigor destroyed by senseless terrorists,” he said. Ugandans today July 11, mark the first anniversary of the al-shabab twin bombings in Kampala. The memorial service led by the Inter- religious council of Uganda and the Uganda Christian Council is taking place at Kyadondo Rugby Club ground, Lugogo. Some People shed tears as internal affairs minister Hillary Onek lit candles in the memory of the victims. Relatives of those killed by the blasts testified that it was difficult come to terms with the loss. “At the same time, I want to appeal to our Somali brothers and sisters to help us so that we help them. We do not have any other interest in Somalia except ideological reasons of Pan-Africanism. We want Africa to be free of all foreign interference; including by these idiots called extremists. Those who died here in Kampala, where there was no war frontline, paid the ultimate price for our country’s commitment to Pan-Africanism. I salute each and every one of them,” he added. The President said the situation in Somalia has now evolved into a real problem for the whole Eastern Africa and even the world. “Somalia is the exporter of terrorism in the whole area. The pirates have made shipping to this region very expensive since ships must make huge diversions in vain attempts to avoid the pirates. Therefore, Somalia is now a threat to the economies of Eastern Africa,” he said. U.S embassy joined Ugandans to mourn the loss of many innocent lives and pledge continued assistance to the Government of Uganda in its pursuit of justice for the victims of this terrible crime. HE LOOKED AT ME, BEGGING THAT I SAVE HIS LIFE. I FAILED. The night of July 10, found me at home--but I was on call for duty; I could be called back to work in case of an emergency. I am not a football fan and I was watching the World Cup finals just because there was nothing else to do. At about 11pm, I received a call from someone who knew that I was a committee member of the Kyadondo Rugby Club and a doctor as well. He told me there had been an explosion at the club and asked me to check if my friends were okay. Hardly had I hang up than I received a call from an intern at Mulago Hospital, saying they needed life support help. That means the patient is critically ill and must be supported to keep alive (anaesthesiology). I called my colleagues; Dr Ronnie Kaddu and Dr Deng Arop to come and help. Within five minutes we were at the hospital from our abode at the Doctors' Village. On arrival, we could not believe what we saw. It was chaos. In fact, we could not gain access through the Accident and Emergency Unit casualty department, which was jammed with cars. We had to go through the fourth floor (which is the main entrance). When we got there, we found doctors from other departments. There was a team from neuro surgery, orthopaedic surgery and general surgery. All Mulago Hospital staff contributed immensely, I was touched by the level of commitment, care and involvement of various specialists. The place was a hive of activity. It was turbulent. There were bodies lying all over the corridor and blood was all over. The victims were in various states of disrepair; some were drowsy, others gasping for life, some were agitated and others had passed on. They had broken limbs, missing and shattered body parts. You would find someone's entire abdomen shattered but their upper body intact. There were all sorts of injuries. Everyone was there trying to help, doctors were doing nurses' work, policemen, volunteers were doing as instructed and there were victims' relatives trying to find them and get help. The head of the Accident and Emergency Unit, Dr Jackie Mabweijano, was already at the hospital. She told me they had identified about 12 people who were in a very critical condition and needed life support and asked that my crew takes over. I had told the intern to get some equipment so she had it with her when we arrived. We began work, trying to sustain life as we took the patients for the CT (Computerised Tomography) scan to help investigate what was wrong and later transported them to the Intensive Care Unit (ICU). Unfortunately, some died before we could get them to ICU. I had never seen some of the injuries I saw that day. It was the first time I was faced with severely injured people of that magnitude, it was painful. One man's head was literally blown off but he was still breathing, one or two died while in the CT scan and when you looked at the images that came out of the scan, they were not compatible with life. Nothing would have been done to save them. I called Dr Kenneth Luzinda, who was covering ICU, asking how many free beds we had. There were already five patients in the ICU before the explosions. Then (and now) the ICU could accommodate up 12 people out of which only six are fully equipped with life support equipment. That meant we had only one free bed with which we could offer life support. But we had about seven people who would have benefited from the life support machines. They all had severe head and chest injuries. We had to make a difficult decision to choose which patient to put on life support and which ones not to. It was very hard thing to do. Unfortunately the one we put on life support first died after about four hours. From that first lot of people that went to ICU, only three people walked out alive. 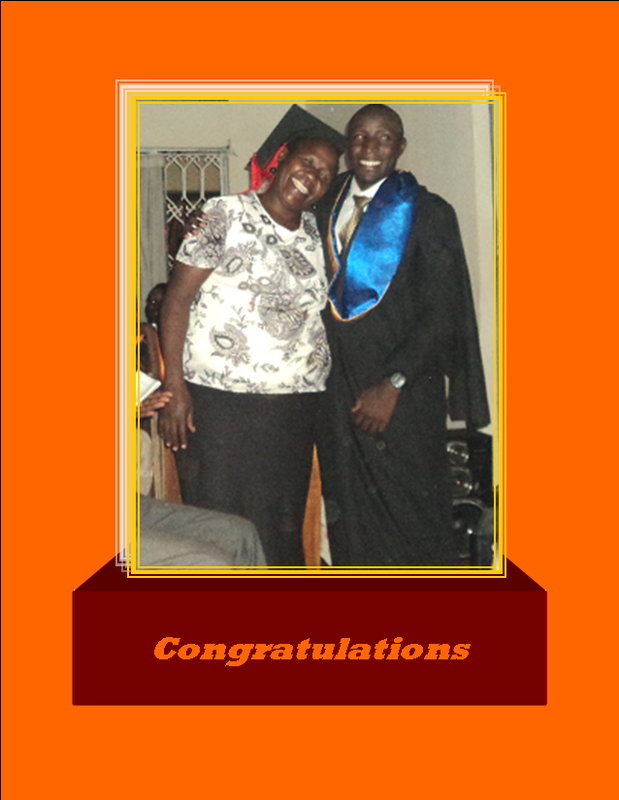 One is Ojara (who now is strapped to a wheel chair and lives in an orphanage in Kitgum. Daily Monitor ran his story on June 17-Editor), another is Timothy but I don't remember the third person's name. But there's a man I will never ever forget. His head received the brunt of the impact and it was terribly deformed. Only his eyes still had life. His eyes seemed to beg me to save him, but I failed. I tried to put a breathing tube down his throat and found bomb fragments inside. I still don't know how they got there. There was no bone structure on his chest so we could not perform CPR (cardiopulmonary resuscitation). His family members were there with him. We could not help him. I gave him a strong dose of morphine so that he could die peacefully. But I still remember those eyes, I always will. The manner in which the injured were transported left a lot to be desired. Many were piled on the police patrol cars. Each car transported about three to four people, so you can imagine what the one at the bottom was going through. In such cases, onsite management is very important. The way victims are handled on scene, the way they are transported and the reception can help improve one's chances of survival (triage). I hope Police have learnt their lesson and thankfully they have started an emergency ambulance service--credit Dr Moses Byaruhanga and Maj. Gen. Kale Kayihura. 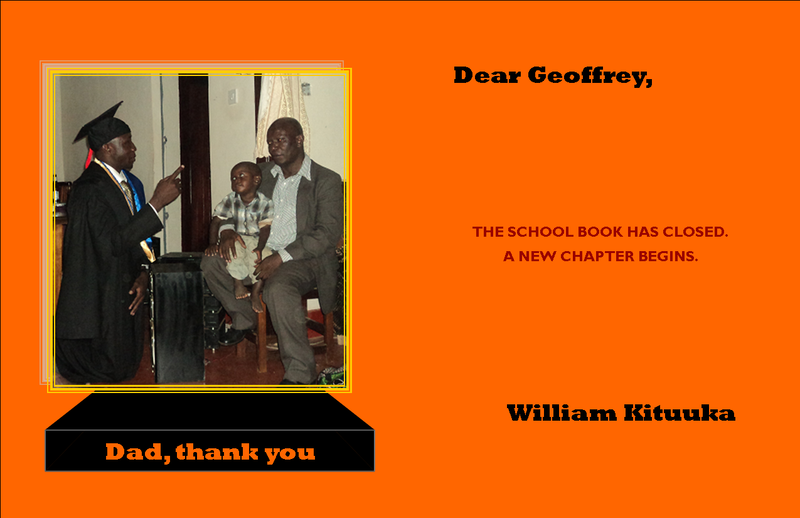 At 6am, I took a break and Dr Cephas Mijumbi came in with a relief team to take over. I was so tired and had become ineffective. I was dumb, drained and my clothes were full of blood. I had to burn the clothes when I got home. I returned to hospital at 4pm, and work was still going on in the five main theatres to help the survivors. It was at this point that I leant that only three of the group of victims we had attended to were still alive. The rest had died. I went to the anaesthesiology office and broke down. I kept wondering why anyone would do such a thing, killing innocent football fans. It is not like they were at war or rioting. Most of the dead were young, energetic people with many years ahead of them. In fact, my initial anger was directed at the government for its involvement in Somalia. But I now understand that it is for our good--for the good of our African brothers. I kept wondering if we could have done better, if we could have saved more lives. It was very disturbing. For the first week I had nightmares. At ICU we are close to death. It strikes you but you must gather yourself and move on or else you will fail to work. My message to the survivors is that you need to know you didn't survive in vain. Work hard to continue your recovery and move on. At the ICU, nothing has changed since 7/11 as far as equipment is concerned yet we could have saved some more people if we were better equipped. The equipment is not cheap but we need it. One bed fitted with all the life saving equipment costs about Shs120m but it can save up to 100 lives in a year. We need to have about 50 beds all complete with life support equipment for Mulago Hospital alone. Situated on the 3rd floor of Mulago Hospital, the Intensive Care unit looks after people who are critically ill and have life threatening illness most of which are usually related to organ dysfunction. The unit operates with two intensivists (doctors who work at ICU), Arthur Kwizera and Jane Nakibuka, its head. Dr Kwizera says it also has a team of 20 nurses who are specially trained in ICU nursing. He adds, "The staff is not enough. Many times, we are supported by people from the department of anaesthesia. A number of medical officers also provide cover during the weekend and on public holidays." "On an average day," says Dr Kwizera, "Dr Nakibuka and I work together during the day for 12 to 16 hours. At night, we alternate on who is first on call in case of an emergency. Post-graduate students who live near the hospital sometimes come in depending on the situation. As for the nurses, they work in shifts of eight hours." In an ideal situation, the unit should have at least six intensivists and 70 nurses. Apart from the staff, the equipment is also not enough. Currently ICU has 12 beds. Of these, six are fully equipped with life support equipment and the others are used for advanced monitoring. This is far from what the unit should have. Business goes on as usual at Kajjansi Trading centre, but the place is on a time bomb in the form of high tension cable that is exposed and all the time workers on drainage are in the area, one is not sure that an explosion will not go off. I don't know how many times i will address this matter before the concerned authorities do something about it. I feel I am tired. TWO electricians with the Uganda Electricity Transmission Company (UEDCL) died yesterday while repairing a faulty high voltage power line in Kajjansi on the Kampala-Entebbe highway. The men were fixing the 33KV power-line when power was switched back from the control room at Lugogo. A third man, whose identity could not be established, was hurled down by the high voltage but survived. Police identified the deceased as Salim Lubega, who died on the spot and the other only by his nickname, Makanika. “Somehow, somebody back at the control room switched back the power before they finished,” a grief-stricken colleague said amidst sobs. Lubega’s body turned white, his left hand was scalded and his shirt partly burnt. His body hung from the wires as firefighters awaited clearance from the control room. The body was removed after three hours. Makanika died on the way to Mulago hospital. This the second incident in which UEDCL electricians have been electrocuted in the city in two months. Last month, another electrician was electrocuted at Kalerwe. Dissolving National Social Security Fund (NSSF) will yet be among other mis-advised moves by the NRM Government. What Government ought to do is simple. Have the sector liberalized but leave the NSSF investments intact such that the workers are at liberty to make savings with companies that will be players in the sector, without having to request NSSF to part with the workers' savings it is holding. Instead, Government should stop encroaching on savings by the workers. Uganda lisks moves which may see the economy completely collapse. With what has gone on in the privatization, it is ill advised to think of selling assets of NSSF. THE National Social Security Fund (NSSF) is to dissolve in preparation for the liberalisation of the sector, Sunday Vision has learnt. As part of the measures, the fund will sell shares held in various companies on the stock market. It has already sold shares previously held in Stanbic Bank. It will also dispose off most of its assets. Some assets, however, are subject to litigation and are giving the managers a headache. “The head of the investment department has all information about the assets to be sold,” a source told Sunday Vision. Efforts to get a comment from the department were futile. Anxiety has gripped NSSF staff following the announcement of a shakeup, as most of them are losing their jobs. Only 67 staff will be retained. When transformed into a pension scheme, NSSF will pay its savers a monthly pension, but not give them their full savings when they qualify, as has been the case. This is part of an aggressive shakeup of its operations and investment mix in an effort to prepare for competition as new players move into the market. Early this year, Parliament enacted a law to create a regulator for the pensions market. It is now in the process of debating another bill that will open up the pensions market to other players. The Retirement Benefit Authority Act takes precedence over all existing acts relating to establishment, operation, management and regulation of retirement benefit schemes. The Bill requires and calls for separation of functions, specifically the administration, trustee, custodian and fund manager functions that NSSF currently handles in-house. Delays in passing the second bill, which will fully liberalise the pension sector, is intended to provide adequate provisions for a smooth transition to prevent confusion and poses risks for the workers’ savings. “We could not pass that Bill which is about liberalisation of the pension sector before a regulator is in place,” Aston Kajara, the privatisation state minister told Sunday Vision before advising this newspaper to contact Maria Kiwanuka, who is the new finance minister. However, attempts to get a comment from her were futile as her office telephone was picked by her aide who promised to call back, but did not. Sources said the Government had decided to expedite the transition and the second Bill would soon be tabled before Parliament. Previous efforts to open up the sector were hindered by lack of funds. Now, the World Bank has agreed to extend $50m (sh130b) loan to “help build a more efficient, robust and deeper financial sector, which can support broad-based private sector growth”. The first pillar will concentrate on supporting the development of a market for pension system reform, specifically supporting the emergence of a regulated, competitive and sustainable pension industry catering for both mandatory and voluntary pension savings. NSSF properties include Workers’ House, Social Security House, Pension Towers, Nsimbe Estate and plots of land in Temangalo, Lubowa, Mbuya and Naguru, among others. However, Workers’ House, Nsimbe and Lubowa estates are involved in cases of litigation, which is currently disturbing the fund managers. In December, the fund sold 40 million Stanbic Bank shares at sh11b, making it the largest single trade since the Uganda Securities Exchange opened about 12 years ago. Efforts to reach Richard Byarugaba, the fund’s chief executive officer, were futile as he was reportedly out of the country. Olive Lumonya, the NSSF branding and marketing manager, said investment decisions were made by the firm’s head of investments. In April, Byarugaba said the fund was readying itself for completion. “A lot of our internal systems are being readjusted. We are improving service delivery channels with a view of becoming more efficient,” he said. “We are also undergoing a restructuring process that will make us leaner but more efficient. There have been many calls to liberalise and reform the pension sector, especially on account of the numerous financial scandals which have dogged the fund over the years. Under the law, all workers are required to save with NSSF. The Fund takes 5% of the salary, while the employer tops it with 10%. However, the workers can only get their benefits after clocking 55 years. Workers have always complained that they can’t use their savings as security for loans and NSSF pays interest below the inflation rate. In the proposed changes, retiring workers will get 30% of their savings and continue getting a monthly pension for the rest of their life. Time is ripe for Ugandans who have been in school not to take us back to the time when the country was led by illiterates. It disturbs to keep hearing from the likes of Sebagala telling us that 'his' council resolved to give the Mayor's House to the Security operatives, that the house was in a bad shape and the council did not have money to renovate it. Such reasoning is silly. The Monitor news paper of June 19, 2008 quoted Kampala Mayor Nasser Ntege Sebaggala saying," he was willing to offer his official multi-billion Kololo residence to the coordinator of the intelligence services, Gen. David Tinyefuza. During an interview with Daily Monitor, Hajji Sebaggala said KCC could not frustrate a government security programme that would benefit all city dwellers." We should have people in office who are worth not a shame. The Mayor is apolitical head of Kampala City. How on earth do you tell people who went to school that council did not have money hence decided to let the security operatives have it! The Mayor is a city like Kampala must have his residence in place and well catered for. Those who made the arrangement to have an official residence of the Mayor knew what they were doing. The security people can find another place after-all there are so many rent-able premises in the city. Kampala Capital City Authority (KCCA) Executive Director Jennifer Musisi has vowed to evict intelligence services coordinator Gen David Tinyefuza from the mult-billion house belonging to the authority in Kampala. The house was controversially given to Gen Tinyefuza in March 2008 after a directive from the then Local Government Minister Kahinda Otafiire, who sighted ‘security reasons’ as the cause for the take over. But while appearing on KfM’s Hot Seat programme at the weekend, Ms Musisi said the house is a property of KCCA and she would have it handed back. Ms Musisi could not be reached for comment yesterday but a senior KCCA official who did not want to be quoted because of the sensitivity of the matter, said the authority was in the final stages of “serving the general with a vacation notice”. “We shall tell him to vacate the house because it is council property. All property belonging to the authority well be re-posessed,” the official said. Before it was taken over by the intelligence chief, the house used to be occupied by the council health chief inspector. The two storey building located at Plot 2, Mabua Road, in Kololo, serves as office premises and a command centre from where the UPDF General coordinates his intelligence work. Gen Tinyefuza could not be reached for a comment by press time. When she was appointed the KCCA boss, Ms Musisi vowed to right the wrongs that have been going on in the management of Kampala city and promised never to have double standards in her efforts to put the city back on track. But Ms Musisi’s move will not be the first time that the city council tries to evict the UPDF strongman. 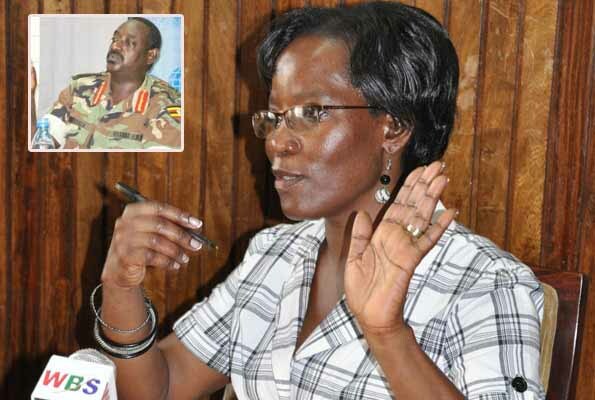 In 2009, Kampala City Council resolved that Gen Tinyefuza, was illegally occupying the house and then town clerk Ruth Kijjambu, told councillors that the security boss occupied the premises before council’s approval. She had promised to petition the current Local Government Minister, Mr Adolf Mwesige, over the issue. But two years down the road, the General is still occupying the premises. If Ms Musisi’s plan succeeds, Gen Tinyefuza will become the second most influential person in government to be evicted from the KCCA’s property after former Kampala mayor Nasser Ntege Sebaggala. Mr Sebaggala was forcefully evicted from a palatial Kololo house and had his property thrown out in the rain by KCCA’s bailiffs after ignoring numerous requests from the Lord Mayor, Elias Lukwago, and Ms Musisi to vacate the house, which he had dubiously acquired during his tenure as the city mayor. Ms Sebaggala claimed that he obtained the house through a council resolution and he even had the President’s blessings. But efforts to get a comment from Gen Tinyefuza on whether the security reasons that necessitated the house takeover still exist, and how he is going to respond to KCCA, were futile as his phone went unanswered. However, the house, which by the time of Tinyefuza’s takeover was valued at Shs5b, currently appears run down with its paint peeling off. There are unverified claims that the place is used as a heavy duty interrogation centre. The former mayor of Kampala, Alhajji Nasser Ntege Ssebagala has defended the occupation of General David Tinyefuza in one of the properties of Kampala Capital City Authority house. Ssebagala says Tinyefuza was given the house by KCC for coordination of security activities. Former mayor Ssebagala says KCC passed a resolution to give him the house in 2008 following a request by then local government minister General Kahinda Otafire. Ssebagala says the house was unoccupied at the time and in a very poor condition, close to being inhabitable. He says KCC decided to pass on the house because it needed costly repairs at the time. The KCC Speaker at the time Shifra Lukwago also confirms the council resolution giving up the house. The KCCA Executive Director Jeniffer Musisi however says the administration has the right to overturn any contracts wrongfully signed in the past. She says it does not matter whether or not contracts exist, adding that they can be cancelled if it's established that they are not in the best interest of the authority. EXECUTIVE Director Jennifer Musisi insists that Gen. David Tinyefuza, the coordinator of intelligence services, must leave the house belonging to the Kampala Capital City Authority (KCCA). She has also warned the General against threatening her, saying she was executing her duties as a government official. Musisi also challenged Tinyefuza to produce documents proving that he or the Government was occupying the house legally. “I would therefore reiterate our request that any official communication from KCC regarding Government/Uganda People’s Defence Forces occupation of the property be availed to us to enable us to account for the property,” the letter reads. Later in the afternoon, while speaking to journalists in Kampala, Musisi vowed to continue executing her duties even if it meant stepping on some people’s toes. “That property belongs to the Government and the people of Uganda. As the accounting officer, it is my role to account for all property belonging to KCCA,” she said. “KCCA is in the process of recovering a lot of other properties and it is my role to find out the legal position of that house,” Musisi added. On July 19, Musisi wrote to Tinyefuza and asked him to vacate the two-storeyed house by August 2 or be evicted. She also asked him to provide a formal instrument mandating his occupation of the property and to explain within two days how he or the army occupied the house. She said the property was registered in the name of the predecessor of KCCA and that the interest in the house had been transferred to KCCA. However, Tinyefuza wrote back, describing Musisi’s letter as “offensive and irresponsible”. He said the house was being used to coordinate intelligence and security. He also argued that he was neither residing in the house nor using it for personal business. “You are free to come and evict whoever you want. I wish you luck,” Tinyefuza wrote. Appearing on a radio talkshow, Tinyefuza threatened to arrest Musisi if she dared evict him. However, Musisi dismissed Tinyefuza’s threats of arrest and described his letter as unfortunate. “But we think the matter will be resolved soon,” she said. She explained that she had faced a lot of resistance in her work to streamline operations in the city since she took office, but vowed not to relent. “This city has had many problems. There are many wrong buttons, but we’ll just keep pressing them. If you are afraid of stepping on people’s toes, nothing will be done,” she said. She had just inspected the multi-million Naguru General Hospital, which is under construction. 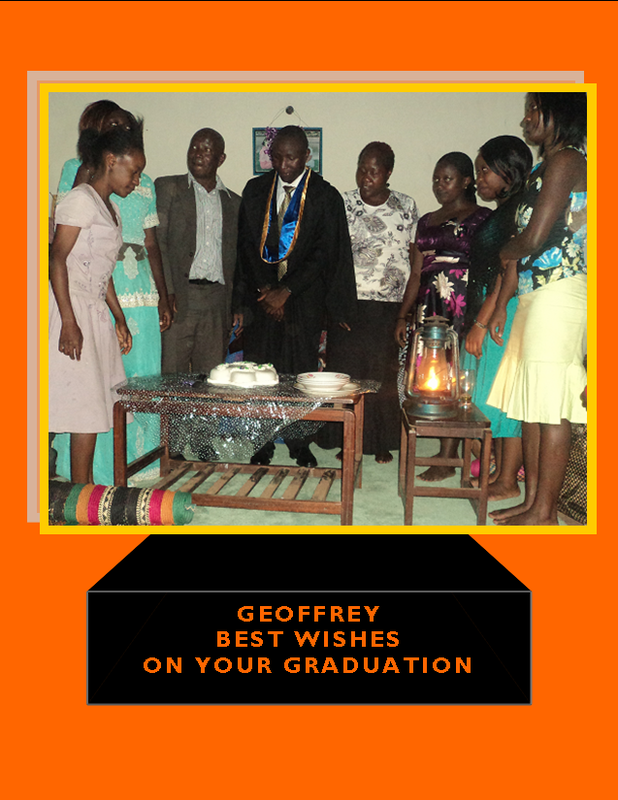 The mansion under contention is located at Plot 2, Mabua Road in Kololo, an upscale Kampala suburb. It was previously the official residence of the city mayor. It is now tightly-guarded and serves as Tinyefuza’s office and intelligence coordination centre. The building was registered in the names of Kampala Municipal Council in 1959, for a term of 99 years, begining January 1949, Musisi said. She said KCCA had no record of any allocation or sale of the house to the army or Tinyefuza. In the letter, Musisi also pointed out an irregular attempt to sell the house to a private company, Pearline Investments between July 2010 and April 2011. Kampala City Council gave the house to Tinyefuza in March 2008, on the orders of then local government minister Kahinda Otafire. Former mayor Nasser Sebagala handed over the house to Tinyefuza amid protests from councillors.